Ibrox Noise: Rangers fan poll: is it time to splash the cash? Rangers fan poll: is it time to splash the cash? With Rangers’ 16/17 campaign off to a stuttering start, flanked by a lack of quality defenders, strikers, and an injury to a key front man, the question of the transfer window has re-emerged again. As fans know, Rangers have done fairly impressively in the window, with an incredibly modest outlay on nine players, and the likes of Joey Barton and Jordan Rossiter being among those secured. But the notion of various strikers costing hard money has resurfaced, and fans are debating the concept of paying serious cash for needed players. It has seemed that the board have been, as yet, unwilling to spend ‘contemporary’ sums in order to secure the calibre of player Mark Warburton probably needs, with accusations Dave King and his colleagues are trying to win or compete on the cheap. As such, is it time for the board to dip their hands in their own pockets and plain spend money? We know the club is not making big profit. We know income levels still are not back to pre-admin levels yet, and as such any investments would be disposable based, and not necessarily something King et al would expect to be reimbursed on. With that in mind, should they spend? King's comments on rtv yesterday strongly suggests he will keep the warchest shut until we get into Europe. Regards 'done fairly impressively' in the transfer market, Hill and Krancjar have been slaughtered past couple of weeks by our fans. Only Barton has avoided too much criticism and looks only half fit. Couple of the other buys are still injured so not sure where the real impressiveness comes into it. We should have been ready to go yesterday but imo we look as if our pre-season was not adequate to get us off to a flier. that total rubbish as we were almost out of business if it had not been for the new guys on the board. if we survive and do well I'm happy to spend next year, but we do need a better defence and we will be fine. we are doing great the way we are building our club lets get behind the club and stop this shite talk, WATP. How many of the 9 will have a resale value? This was the strategy outlined by King a few month's ago and having to overspend/outspend Celtic. Had Dave misplaced the key to the warchest? Hill, Kranjcar and Barton are there to provide the leadership and guidance for the younger ones. Clearly not evident yesterday but you have to recognise what Warbs is doing. The young lads we have recruited will have great resale value so I don't know what your point is? Imagine we spent £15mil on a squad and we finish 4th!! We need to grow slowly and mature in this league. Seriously gents and ladies, in my opinion, there is no more cash to splash at this present time. There has obviously been a large increase in staff, annual salaries have to be paid, infrastructure repairs and refurbishment and that all coupled with the lack of merchandising and european tournament income must be crippling. I think we're doing well keeping our heads above water to be honest. Well said!! Frustrating listening to our fans demanding we go back into administration to compete this season. We still need to get a solid centre half in . Hill doesn't look like the answer and i cant understand why we never brought back Boogie , who was a far superior player than any of our centre backs . We don't have money to spent at the moment , but we really need a strong centre half and probably a striker , as Waghorn looks like he may be injury prone and Kenny's not the player he once was . It will have to be frees and we need to move quick ! 500,000 shirts, aye right, straight out of a Charles Green dream. Yep, our mega rich fans have been tripping over themselves to throw money at the club. Get real, financially we are in a mess with ST'S being the only major source of income. Further soft loans will be required to see out the season. £20m revenue, £30m expenditure.....do the sums, where will the monies come from? Oh that's right the mega fans who stood back last time when we went to the wall. I think until the retail stuff is done with there is no point whinging about cash. We have a competitive team that should secure a euro slot next season. Good enough. Once Cashley is gone then we can start grumbling about spending cash. Good job Rangers. More vague statements from the chairman... No more funds til Xmas, for me you need to fork out more for less quality in the Xmas window, why not now, if the cash is there? Talking of the commercial off field ongoings, does King just intend to ignore contracts with 2 huge companies? And the sponsor will no doubt be next to come at us. All bluster if you ask me, what sponsor or shirt manufacturer will touch us if this is how we treat them. We obviously do not have the cash to go to court with these companies to dispute contracts and King doesn't seem much of a persuasive negotiator to me. I cannot see this being resolved any time soon regardless of what King suggests. B*ll*cks. Which 2 huge companies, Ashley and Puma? We are at war with Ashley, we faight and win or go under. So far, we are winning, but the big battle remains. King is playing a poor hand well. Ashley knows, he dealt the cards from a bent deck. Puma, they are presumably seeing this as the cost of keeping in with Ashley. They don't hate Rangers, but they need Ashley. We have been to court, and won in case you have forgotten. The latest step was withdrawing the licence to the crest. This will undoubtedly end up in court again. We have to hope we win again. Sponsors will trust us if we are open with them, which we are - except for Sports Direct, who can go replicate themselves!! we need financial prudence and not another spend beyond our means fiasco...spend what we earn and not any more than that ! Any fan that doesn't get that will have us in admin all over again. If OHalloran, Dodoo and Forrester were played at the start,, we would have won that game yesterday,,, need to start using Miller, Kranchar and Halliday as subs,, Kranchar was lost in space,,guilty of being far too lazy,, this league is fast paced and need younger players to compete in the middle,, we do need better Centre Halves,, we known that for over a year now,, Kiernan is just plain shite! I think Tavie should be challenging for a place as right wing that gives more options also. Without Waghorn we are in a world of hurt. Kenny did brilliantly last season when Wags went down. But this is the top flight now and he did not have a great game yesterday. Dodoo looks like he has potential, but it's a stretch to think he can be dominating every game. Hardie would have been a better choice. We are outrageously short of coverage at striker and centre back. If we drop more points in the coming weeks, ther is only one guy to blame - MW. Granted, he has had one hand tied behind his back by King and the board, but he has over-spent on midfield coverage, leaving us vulnerable in defence and strikers. Tell you what we need, a manager who can outwit others and has the ability to change the game. It may be okay for some to have a team that has 65% of possession but it reality it means nothing if you don't get the points. A long hard season ahead. There has been no profit made in the last 4 seasons. We have lost between 5 and 10 million every year so the comment that the club isn't making big profit is way wide of the mark. There is very little money in European competition except the champions league which is extremely difficult to qualify for. We were never going to be able to step up a league, sign half a squad of new players and hit the ground running. Anyone who beleived that is living in cloud cuckoo land. Lets give the lads a game or two, let them get settled into the squad and take it from there. It's a long season ahead so give them some scope. I think, as a club we are lucky to have our present board and it's because they care about the club, they are not willing, under any circumstances to put us back into financial trouble. After all wasn't that the solemn promise that these guys made when they took control. OMG, there is no cash. When King says we will spend blah, blah, blah.....he's talking about ST monies and 1872 contributions, not his cash! Already the Dundee game is a must win. Hearts played well against the Tims today but a little bit of quality made the difference. If we drop any more points before we go to Parkhead in a month's time then the league challenge could be over before it's even started. Rangers being a good team seems to be based on beating Celtic in a one off cup game last season. 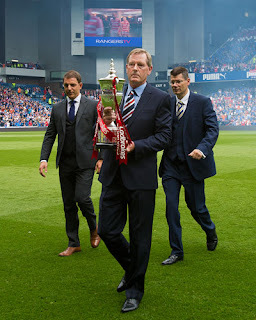 Rangers fully deserved their win but let's not forget Celtic didn't turn up and also had a manager out of his depth. Also they were that bad and still took the game to penalties. Celtic under Rodgers will be a different kettle of fish. As if we'd come up saying let's aim for top 6! Aim to be the best and nothing but the best that's how winners are made!! Rangers are the most successful club in the world and we have a team that will compete! We need to sit tight. We usually start the season with shite results. There is no need to press the panic button. Give the lads a chance to bed in. If there is spare money,spend it when we need to. apart from Tommy Hutchinson a full backs nightmare,you can read straight away what some of our players are going to do, time they get it on their left the moments gone so easy to read, a good center forward,, like Stein Hately etc,and a good old fashioned center half. Kranjcar is looking very like the player that the QPR fans loved to hate.....lazy doesn't do his performance justice . lennon put 5mL price tag on him, we dont even have 0,5mL on anybody, we are skint in terms of money designed for transfer fees. king promised money and gave none, celtic give 4mL for sinclair and king warns that "the objective of rangers is MINIMUM top-two finish". its getting more ridiculous as the time passes.. I agree about Cummings. He would double in value. Top 6 place , your having a giraffe. Our revenue is more than the rest of the league put together, with the exception of them, yet top 6 is good enough for you? If Warbs doesn't finish 2nd he will be sacked or quits because of lack of support from King co. Pure pish were going back down! Income from STs and soft LOANS end of. King has no money as it is locked up in SA. Investment? Forget it. Warbs works wonders with mediocre bargain basement player's. Just think what he could achieve if he had funds available! DK is well aware of this however the plain and simple fact is that there are no revenue streams. The ST money is ring fenced for court cases and stadium repairs. Do you honestly think DK will invest what little he has on players knowing that there is huge potential liability to address! He has to manage the club. Can you all seriously not see the big picture? Let me spell it out ....DK sanctions £10M spend..Ok great, better players arrive. Ashley, puma win court case, stadium repairs are imposed due to safety concerns?..mmm now let me see, no loans available from a bank, no soft loans available as still haven't repaid any of the original soft loans..What does this mean? It simply means admin2..Get it ? Don't blame DK for trying to keep the club solvent. Something that previous chairmen and boards couldnt do .. wake up!